Update 12/12/2017 12:05 - SfB CU out taking the version to 6.0.9319.510 has a fix for this. 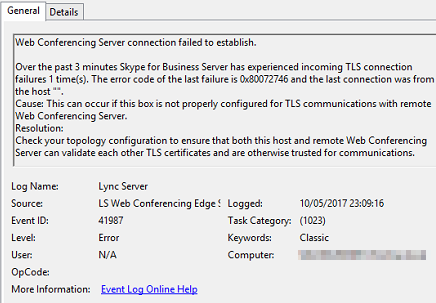 Nothing expected for Lync Server 2013 or 2010. Update 23/05/2017 23:12 - Official confirmation should appear under https://support.microsoft.com/en-gb/help/4023993 within 24 hours. Product Group have Development Resource assigned so looks like a CU will be coming to fix this. 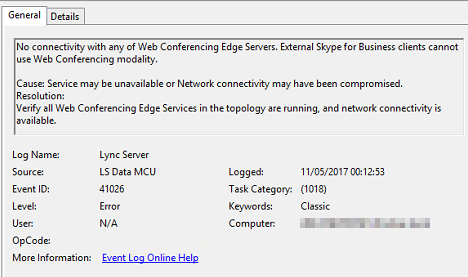 "No connectivity with any of Web Conferencing Edge Server, External Skype for Business clients cannot use Web Conferencing modality"
Over the past 3 minutes Skype for Business Server has experienced incoming TLS connection failures 1 times(s). The error code of the last failure is 0x80072746 and the last connection was from the host ""." "This update adds an additional check on Enhanced Key Usage (EKU), since all Lync/ SfB Server usually use the Web Server template they will only have the Server Authentication in the EKU." Issue has been reproduced on Lync 2010, Lync 2013 and Skype for Business 2015 on all supported server versions (2008r2, 2012, 2012r2). 1 - Request new Edge Internal certificate with the Client and Server Authentication. 2 - On the Front Ends disable the check for the Web Conferencing Service. Please note that these registry keys are for the default install locations. Note: Lync Server 2010 still uses the .NET 3.5 this is why we have the v2.0.50727. Thanks to David Paulino (Twitter) at Microsoft for the update. Seeing different items broken in different environments from the following list: Q and A, Screen Share, Whiteboard, PowerPoint sharing via OWAS/WAK/OOS (Thanks Py7h0n and others for reporting). Thank you for the valuable update. I confirm the issue in at least a customer and reproducing on our labs. Thanks. We had the same issue, and figured out it was the update for .Net framework. We are running 4.6.2 (that has been supportet sins last Skype update). I has just testet out the newes Skype update (from yesterday) - still truble with the .Net framework may update. Microsoft SfB Product team are investigating and a public KB will be available at some stage. At the moment not confirmation if the fix will be to deploy new certificates or if it will be addressed in a future Cumulative Update. Whiteboarding and screen sharing. Once certificates were regenerated both worked as expected again. We were fortunate this time as we use public CAs for internal names also, and both key usage is present in all our certificates. Yep - quite similar! That one had a client side fix though. This is between the servers so going to be either a CU fix or a change in what certificates are recommended.